If you love scams, hustles, cons, bar betchyas, flim-flam, stings, snow jobs, bamboozles, chicanery, shams, fixes, baloney, and other dirty tricks then this ebook is for YOU! In this follow-up to his popular eBook How to Sell Bridges , David Devlin teaches the finer points of some of the many scams and hustles that have made him a lot of money. He also discusses some of the more elaborate cons that have been used throughout history and the cons who pulled them off. Also discussed are cons used today including selling ridiculous products, phony business "opportunities", scamming major corporations out of thousands of dollars (yeah, don't do it), rigged games, and more! Also is a detailed description of the greatest con that can no longer be pulled. This was one of David's favorites back in the day. You will admire the simplicity in many of the scams, and the elaborateness of the others. 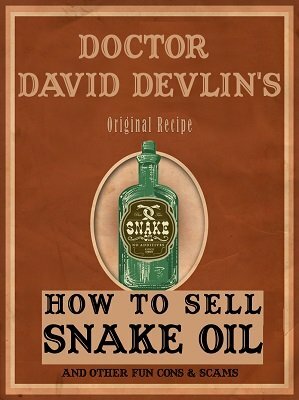 This eBook has everything from a simple trick to how to sell Snake Oil.